Blend your own chocolate coconut smoothie recipe at home and receive the health benefits of coconut oil. These easy vegan recipes are healthy and full of beneficial fats. Not only will your taste buds jump for joy, but your skin will thank you too! Try and see that they are the best chocolate recipes! Coconut milk is a great way to make up your own chocolate shake. I wish that I could be right there to show you how easy it is to make a chocolate coconut smoothie recipe. For those of you like myself and my mom, we love coconut in everything. And the idea of mixing delicious chocolate and coconut together is like pure genius. You don’t need any dairy to make the best chocolate recipes in your own blender! Since the dairy is replaced with coconut milk, you can blend healthy vegan desserts for your family and friends. Perhaps, you will see that coconut and chocolate are destined to be together. One thing that most people dislike about coconut is the texture of the shredded coconut. Never fear! Completely smooth texture is here! 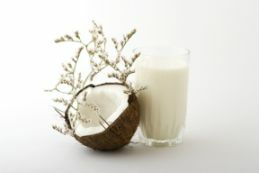 Coconut milk comes from the meat of a mature coconut. The healthiest way to get coconut milk is from the actual coconut. If you don’t have the time to be cracking a coconut and squeezing the milk from the meat, you can purchase the milk in a can or as a powder. If you decide to get the milk in the can for your chocolate coconut smoothie recipe, make sure that the coconut milk does not have added sugar. There are usually two ways to get the milk in a can. Thick and thin. I prefer to buy the thick version. It does have more fat than the thin version, but you can save money with the thick milk by diluting the milk with water. For instance, use 1/4 cup of thick coconut milk with 1/2 cup of water instead of using 3/4 cup of thin coconut milk. The nice thing about this is that you can decide to dilute it with water when you want. Usually, you will only use 1/4 to 1/2 of a can of milk for a chocolate smoothie. Please make sure to refrigerate the leftovers for future delicious smoothies. Perhaps, you would be interested in a pina colada smoothie recipe. Coconut milk powder is the most convenient way to get the benefits and the taste of coconut in your chocolate coconut smoothie recipe. Try a Chocolate Coconut Smoothie Recipe! Pour the milk and water into the blender with the avocado, lucuma, palm sugar, stevia, and cacao on top. Blend. Add ice and blend until completely smooth. First, blend the coconut milk, dates, stevia, vanilla, carob/chocolate, and water. Then, add the banana and ice and blend on high until smooth. Use more coconut milk powder for a creamier consistency.